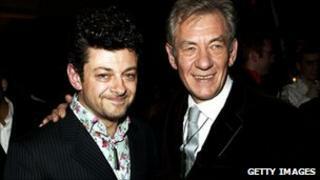 Cate Blanchett, Sir Ian McKellen and Andy Serkis are among the stars who have been linked with the two big-budget Lord of the Rings prequels. But seven unions in the US, Australia, the UK and Canada said producers refused to negotiate a deal with them. The New Line and MGM studios are financing the films. New Line declined to comment and MGM were unavailable. The Lord of the Rings director Peter Jackson is to be executive producer. The unions, under the umbrella of the International Federation of Actors (FIA), said performers in New Zealand had "struggled on non-union contracts" for some years. Those contracts "provide no minimum guarantees of wages or working conditions", no payment for future broadcasts and no cancellation payments, they said. "The International Federation of Actors... resolved that the time had come for performers around the world to support their colleagues in New Zealand and seek a union contract for all performers on The Hobbit," a statement said. The FIA said producers have argued that entering into an agreement with the union would break New Zealand competition laws. It is the latest setback to hit the movies, which have been in the pipeline for several years. The project has yet to officially receive the go-ahead by New Line and MGM, due to ongoing financial problems. Filming was originally scheduled to start last year, but will now not take place until 2011. Mexican-born director Guillermo Del Toro signed on to direct the films, but pulled out in June citing delays. Peter Jackson, who won the Oscar for best director for his work on Lord of the Rings: The Return of the King, is expected to replace him at the helm, although no official announcement has been made.